Tomorrow I leave for Las Vegas. Blog World Expo begins tomorrow and I am going. Already I have a ton of things planned. First off when I get off the plane I will be on the lookout for Julie who has kindly offered to pick me up. That is so great of her. I am looking forward to hanging out and going to In And Out Burger. I’m staying at the Sahara and my friend Brett is sharing the room with me. Brett is the man when it comes to knowing people int he blogging world. I am going to learn a lot from him. I’m also going to go on a Photowalk that is being led by Kris Krug, I’m excited to meet him. I remember hearing about him in one of Robert Scoble‘s photowalking podcasts. The photowalk was put together by Darren Prowse and it is a Las Vegas Digital Photography School Photowalk. And then later that night there is a big party at Bare Lounge at the Mirage Hotel. I got an invite from Internet Geek Girl herself Stephanie Agresta back at IZEAFest. I hope I can make it to everything, it should be a great time. My you have a lot of stuff! We are looking forward to seeing you tomorrow! Hey Can’t wait to see you tomorrow Drew and Jules too! Looking forward to getting caught up with lots of folks, especially since I couldn’t make Izeafest (house issues at the place in Atlanta). Just to add to your list of things happening, I wanted to mention that there is also a Tweetup at the Tempo Bar in the Las Vegas Hilton. The Tempo Bar can be found by walking in the front doors, straight down the steps, through the casino, over a black jack table or 5 and on through until you hit the bar. At New Media Expo, this became a bit of a default place for people to hang out in the evening, having drinks, or staging various leaps to dinners, parties, or back to the show. iCes last blog post..I’m Back! I pack for all occasions. 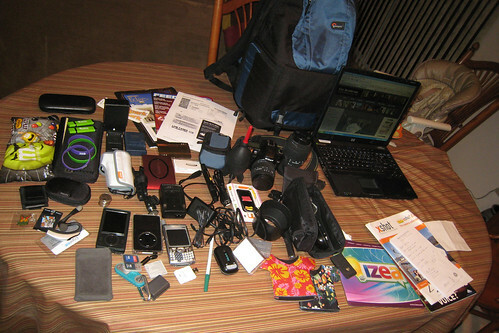 I have to make sure I’m prepared to cover an event such as Blog World Expo. Looking forward to tomorrow. Thanks for the tips, I’m glad I’m sharing the room with you, you are one connected guy that knows what’s what and who’s who. This is going to be a very fun weekend. I would have to respectfully decline your request. Maybe If I do some sort of contest I could give them away. Any sponsors want to give away some laptops and ipods. I know. But a contest like that would be fantastic. Have fun and give Jules and Brett a hug from me! You are like a bird, flying everywhere! I am like a bird for sure. Flying off the the airport in a few minutes. Thanks for stopping by. I absolutely love your blog design. It is amazing. I look forward to learning more about photoshop from you. vegas should be fun for you….i think the photowalk sounds awesome as there’s a lot to take photos of. i lived there 21 yrs and i used to work at the Sahara (i don’t like it LOL). Vegas was a very good time, the photowalk was also very fun, so many different photographers present.